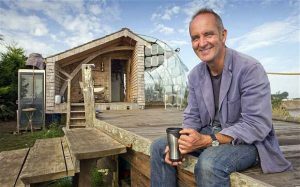 Launched in a blaze of gushing publicity in the autumn of 2015, snooty TV celeb, Kevin McCloud’s HAB building company’s development on the site of Dunmail Primary School in Southmead was touted as the sustainable HOUSING OF THE FUTURE. A major PR effort back in 2015 with public schoolboy Mayor No-more Ferguson front, back and centre alongside the Cambridge educated TV presenter waffled a lot about “partnership” and “sustainability”. So it was only a matter of time before the scheme would need a PUBLIC HANDOUT wasn’t it? Fast forward to May 2017, eight months after master builder McCloud should have began work, and we find the shyster TV presenter has failed to “roll up his sleeves” and get a shovel in the ground in Southmead as promised. Instead, he’s working hard alongside accountants in his office and is now DEMANDING we – the council tax payer – UNDERWRITE his fancypants state-of-the-art development! Just weeks before Kevin was finally threatening to get those shovels out, he discovered that the private rental element of the state-of-the-art mixed scheme of social housing, affordable housing, private rental and private purchase housing he promised was too much of a RISK! So we, the council tax payer, will now act as guarantor for the scheme after the Rev Rees’s cabinet agreed to a last minute BAILOUT of £500k to get this private sector scheme off the ground. This entry was posted in News and tagged Affordable housing, Bristol City Council, Dunmail Primary School, George Ferguson, HAB, Kevin McCloud on August 2, 2017 by thebristolblogger. The Appendix of the Cabinet report clearly states the developer as United Communities/HAB. Bristol and Bath Regional Capital CIC are described as a funder of the development. It is BBRC element of the development which is being underwritten not the private development by HAB or even the housing association affordable element under United Communities. Are we guaranteeing money to Merchant Venturers ? Tim Ross, the Vice-chair of BBRC, is a Merchant Venturer. It seems one can’t lift a stone in Bristol without at least one of them crawling out from underneath.